Meet the mystical world of nature which has been developing for thousand of years, far away from the light of the day and the human eye. Visit the underworld the Baredine Cave. This cave is a treasure chest of stalagmites and stalactites, underworld sculptures created through time by the patient work of water. Such shapes have been created, some of which are exceptional, such as the 10 meter long and high curtains, a very realistic sculpture of Our Lady, the body of a milkmaid called Milka, the leaning tower of Pizza and snowman the torchbearer-who has become the trade mark of our cave. In one of the atriums you will pass a crater that is 4m wide and 66 m deep which goes down to the underground lakes. And so through five halls, five galleries of abstract and realistic sculptures, a pleasant 40 minute walk, accompanied by our guide and custodian. The excitement of this adventure is also meeting the animals of the underworld. You will see the human fish and endemic animals that live only in this environment, miniature see-through crabs and insects. At the cave’s entrance there is a museum showcase where pottery of prehistoric man has been exhibited. Our far ancestors would probably leave the pots during the hot, dry, summer day to collect the precious water, drop by drop. To make it accessible to visitors there are safe paths in the interior of the cave, which is about 80 metres deep. 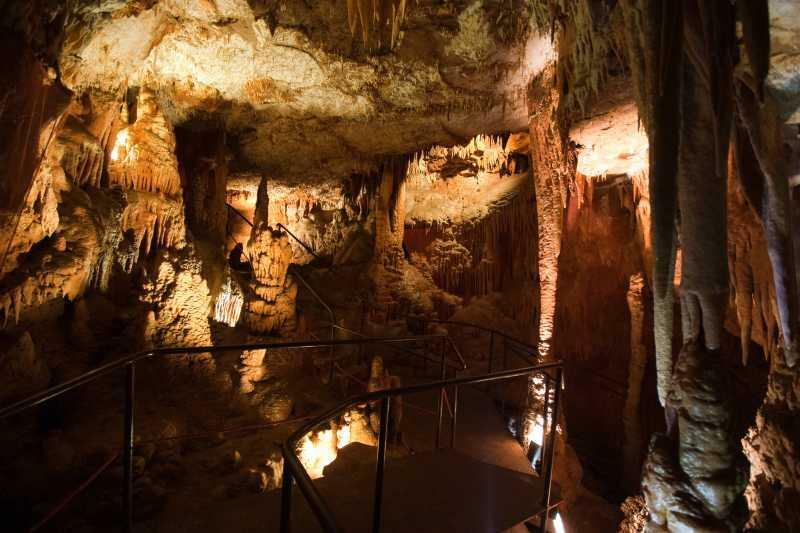 The cave abounds in wonderful dripstone forms, among which it is easy to recognize ‘the magician’s hat’, ‘Tower of Babylon’ and huge ‘bat wings’ strangely covered with grapevine that gets its water from the bottom of the cave. By visiting this ‘kingdom’ apart from the beauty that lies hidden below, you can also enjoy the idyllic scenery together with facilities such as children’s park, mini farm and bar.